New York's Metropolitan Opera has established a record for its box office opening day, selling more than $2.6m (£1.6m) million worth of single tickets for the new season. More than 24,000 tickets were sold on Sunday when the box office began business, beating last year's total of $2.5m (£1.5m). In recent years The Met has been experiencing financial struggles because of the recession. The new season begins next month. A new production of Wagner's Das Rheingold, directed by Robert Lepage and starring Bryn Terfel and Stephanie Blythe, will open the season. 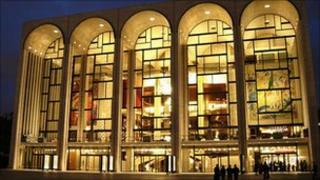 Last year the Met's general manager, Peter Gelb, said that funds for the venue had substantially dropped and he was looking at ways to cut costs. He revealed that staff would face pay cuts and principal singers would be asked to perform for reduced fees.